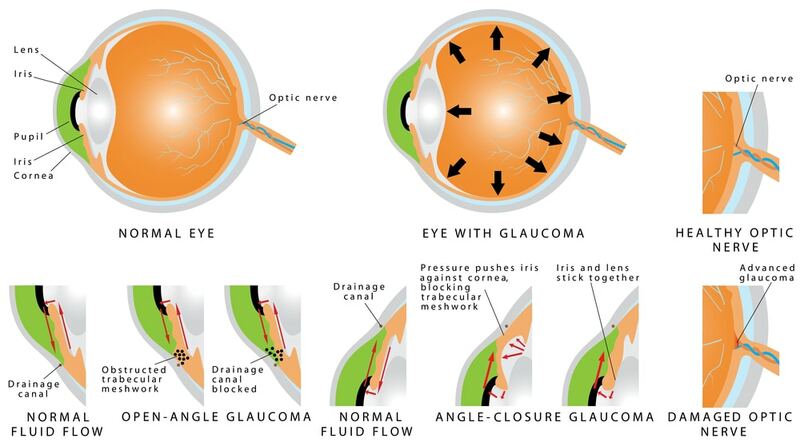 One of the most common types of glaucoma is open-angle glaucoma. If you have glaucoma you probably won’t know you have it, especially in its onset stages. As we age our eyes change, but often we cannot notice, or know, if we have an eye disease. Early diagnosis can prevent or slow down vision loss. 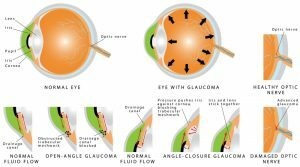 The vast majority of people presenting with glaucoma have open-angle glaucoma (also called primary open-angle glaucoma). In this condition normal drainage channels in the eye are clogged up. This can increase internal pressure on the eye, lead to damage of the optic nerve, and affect your vision. “Open-angle” refers to optic nerve damage associated with the angle between the iris and cornea, and elevated eye pressure. While eye blockages may appear to happen suddenly, in fact they build up over time. Thus, open-angle glaucoma tends to me more common in elderly people. The disease is progressive and irreversible and in some cases can lead to blindness. Open-angle glaucoma tends to be inherited and is due to a build-up of pressure in the eye. This can damage the optic nerve which allows you to see, leading to gradual vision loss. Risk factors include age, the degree to which pressure has built up in your eye, family history, and African ancestry. If you are very short-sighted or have diabetes or hypertension you could be at greater risk. Another risk factor is if you have a thin and/or pliable cornea. Eye doctors use techniques such as ultrasound to measure this. Initially there are no symptoms, as these develop over time. Vision loss or blind spots may indicate you have open-angle glaucoma. Once detected, progression of the disease can be slowed, but not reversed. So, early screening is important. Eye specialists have instruments which can check the health of your optic nerve and the relevant angles in your eye. If you have high eye pressure with no signs of optic nerve damage, you may be able to prevent glaucoma. So routine screening to detect optic nerve health and any abnormalities is very important. As with most diseases, maintaining a healthy lifestyle is important. If you are a smoker, stop smoking. If you are overweight, try to reduce your weight. Watch your blood sugar levels. All these things can improve your health and reduce the chances of vision loss from open-angle glaucoma. The main aim of treatment for open-angle glaucoma is minimizing damage to the optic nerve. This can be done through medication, laser treatment, and surgery. Eye drops can positively affect the fluids in your eye and help prevent permanent vision loss. However, it’s important to understand that these have side effects. Getting advice from an experienced eye specialist is essential. Once medical treatment has begun, follow-up visits will be necessary to monitor treatment impacts. The ophthalmologist will want to recheck eye pressures, and may well say you need to take the eye drops indefinitely. Laser treatment applied to drainage channels in the eye is another possible way of reducing pressure in the eye. Be aware that even if such treatment is successful you may have to continue using eye drops. Various surgical treatments for open-angle glaucoma are also possible. These include micro-invasive glaucoma surgery, trabeculectomy (creating an alternative pathway for eye fluids), and drainage implant surgery. Ours is the first walk-in eye center in New Jersey. We are proud of the services we provide to the local community and the wider public. Our experienced team of ophthalmologists includes Dr. Frank Parisi, a board certified glaucoma specialist well-versed in open-angle glaucoma. We accept patients with Medicare and all major insurance plans. Drop in and see us for a vision check to prevent vision loss from open-angle glaucoma. Short Description: One of the most common types of glaucoma is open-angle glaucoma. If you have glaucoma you probably won’t know you have it, especially in its onset stages. As we age our eyes change, but often we cannot notice, or know, if we have an eye disease. Early diagnosis can prevent or slow down vision loss. Ours is the first walk-in eye center in New Jersey. We are proud of the services we provide to the local community and the wider public. Our experienced team of ophthalmologists includes Dr. Frank Parisi, a board certified glaucoma specialist well-versed in open-angle glaucoma. We accept patients with Medicare and all major insurance plans. Drop in and see us for a vision check to prevent vision loss from open-angle glaucoma.